Autodesk has been moving decisively in the home 3D printing space, buying 3D modeling software Tinkercad and releasing apps to help amateur modelers create 3D goodies using their phones. 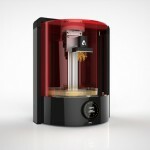 Now they have somewhere to send all those 3D models: a new 3D printer called the Spark. The project is two-pronged. First, Spark will exist as a platform that users can build upon and use to render 3D prints. Based on this platform, Autodesk will produce a simple stereolithographic printer for an estimated $5,000. The plans will be available to anyone who wants to build the unit themselves. Spark is an open 3D printing platform that will make it easier for hardware manufacturers, software developers, materials scientists, product designers, and more to participate in and benefit from this technology. Spark connects digital information to 3D printers in a new and streamlined way, making it easier to visualize prints and optimize them without trial and error, while also broadening the range of materials that can be used for printing. And because the Spark platform is open, everyone can use its building blocks to further push the limits of 3D printing and drive fresh innovation. Autodesk needs to enter the desktop printer space. Stratasys announced solid revenue thanks to their acquisition of MakerBot and 3D Systems, another industrial maker, is busy trying to grab the home user. Why? Because industrial printers are prohibitively costly and are sold with a lot of overhead. Home 3D printers are basically commodity devices, like any HP inkjet. Here’s hoping that the Spark will help grow the stereolithography market considerably and that it becomes the Android of 3D printing. Printers need standards and given the massive changes going on in the community, a bit of stability will be quite welcome. Posted in Autodesk, MakerBot, Stratasys, Tinkercad. Bookmark the permalink.